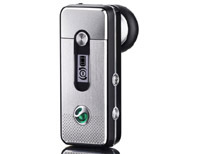 The Sony Ericsson HBH-PV740 is a Bluetooth headset that provides great digital sound and several usefull features such as an easy to read information display that indicates the battery status at a glance. It has been developped in coordination with all Sony Ericsson mobile phones, but is also compatible to be used with Bluetooth equipped phones from other manufacturers. Auto volume adjustment will adjust the volume in less than a second if you enter a noisy environment while Adaptive Frequency Hopping (AFH) reduces interference from other devices for excellent audio quality.